Back to Front has made its first home in Harehills and Chapeltown but the approach will be adaptable to any place in the future. Please contact Back to Front if you are interested in finding out more about how we are progressing with this. 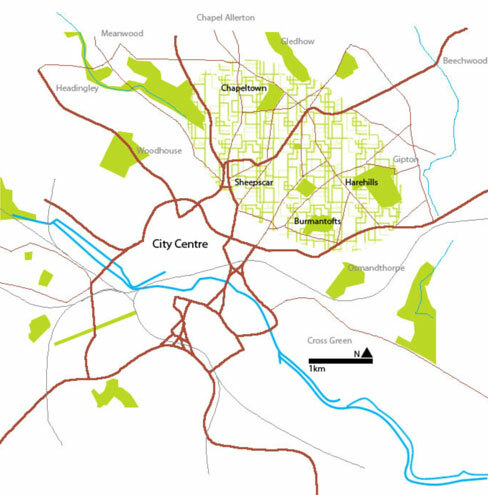 The households targeted with the Back to Front project are in inner North East Leeds. Inner NE Leeds is a vibrant and ethnically diverse area with more families on average than the rest of the city (Source: Leeds City Council Neighbourhood Index 2009). The area is also among the 10% most deprived places in the country. This indication of deprivation is based on the grounds of poor health, housing, employment and education indices (Source: Index of Multiple Deprivation 2007). 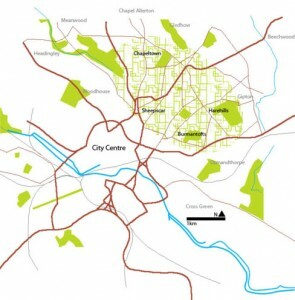 By working in the densely populated regions of inner city Leeds we are hoping to encourage positive environmental behaviours, such as growing food, to help people make the most of their environment and to promote activities like gardening that have a positive impact on both physical and mental health.